Goswami Tulsidas, the sixteenth century poet, one of the greatest Rama-bhaktas of all time, incarnation of Rishi Valmiki was the composer of famous works like Hanuman Chalisa, Ram Stuti and most notably, the Ramcharitmanas. “Though as a woman I am not qualified to hear it, I am Your servant in thought, word and deed. Saints do not withhold even an esoteric truth wherever they find a man smitten with agony, and therefore qualified to receive it. 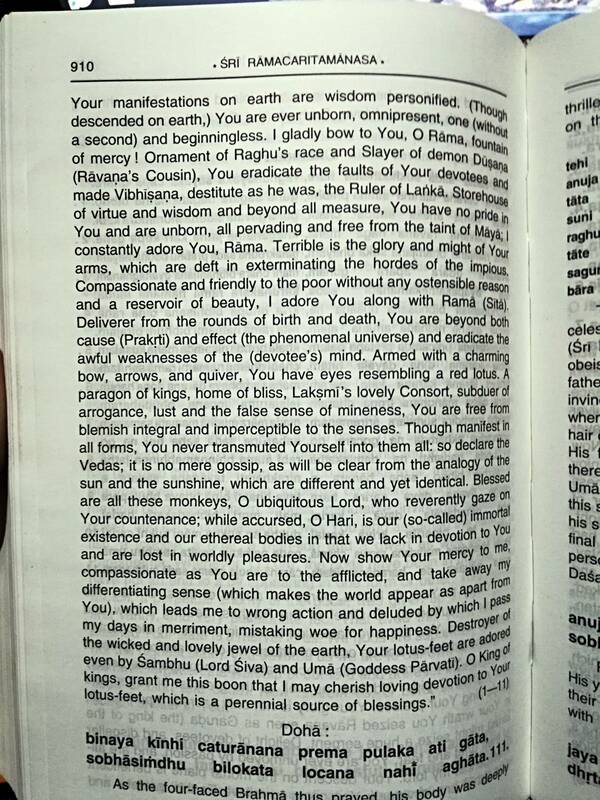 I ask You with a heart sore distressed; be gracious enough to narrate the story of the Lord of Raghus. First tell me after a mature thought what makes the unqualified Brahma assume a qualified form. Then, my lord, relate the story of Sri Rama’s descent, and tell me next the charming exploits of His childhood. Then let me know how He wedded Janaka’s daughter, Sita, and the fault for which He had to renounce His father’s kingdom later on. Then describe the innumerable deeds performed by Him while He lived in the forest; and further tell me, my lord, how He killed Ravana. Then relate, O blissful Sankara, all the numerous sports that were enacted by Him after his coronation. As per Tulsidas, Rama is the efficient and material cause (Nimitta and Upadana) of the world, which is real since Rama is real. In several verses of the Ramcharitmanas, Tulsidas says that the animate and inanimate world is a manifestation of Rama, and the universe is the cosmic form of Rama. Authors interpret these verses to mean that the world is real according to Tulsidas, in keeping with the Vishishtadvaita philosophy of Ramanuja. However, at some places in the Ramcharitmanas and Kavitavali, Tulsidas compares the world to a night or a dream and says it is Mithya (false or unreal). Some commentators interpret these verses to mean that in Tulsidas' opinion the world is unreal as per the Vivartavada doctrine of Adi Shankara, while some others interpret them to mean that the world is transient yet real as per the Satkhyativada doctrine of Ramananda. Uday Bhanu Singh concludes that in Tulsidas' view, the world is essentially the form of Rama and appears to be different from Rama due to Maya. Its visible form is transient, which is what Tulsidas means by Mithya. In the Vinayapatrika, Tulsidas says that the world in itself is neither true (Satya), nor false (Asatya), nor both true and false together (Satyasatya) – one who casts aside all these three illusions, knows oneself. This has been interpreted to mean that as per Tulsidas, the entire world is a Lila of Rama. At the beginning of the Ramcharitmanas, Tulsidas performs Samasti Vandana (obeisance to all beings) in which he bows down to the world also, saying it is "pervaded by" or "born out of" Sita and Rama. As per some verses in Ramcharitmanas and Vinaypatrika, when a Jiva (living being) knows the Self, Maya and Rama, it sees the world as being pervaded by Rama. Was Tulsidas an Advaitin or Vishishtadvaitin? Or was he a reconciler of Advaita and Vishishtadvaita, similar to Sri Ramakrishna Paramahamsa? P.S. I would really appreciate if somebody could identify and provide the verses in Tulsidas's works which seem to be Advaitic, Vishishtadvaitic or both. does all the deeds without hands. and inhales all the scents without a breath. For the gratification of his own self Tulsidasa brings forth this very elegant composition relating in common parlance the story of the Lord of Raghus, which is in accord with the various Puranas, Nigamas (Vedas) and the Agamas (Tantras), and incorporates what has been recorded in the Ramayana (of Valmiki) and culled from some other sources. "You are Maya, while Shiva is God Himself; You are the parents of the whole universe. Bowing their head at the feet of Parvati, they departed. A thrill ran through their frame again and again." Lankakand Doha 110 and the following 11 Chaupais mention everything you need to know with a mix of Advaita and (mostly) Vishistadvaita. Anyway this is a very small reference to Advaita, mostly because Tulsidas was a Vishishtadvaitin and a Bhakta who focused less on the impersonal aspect, and more on the personal. 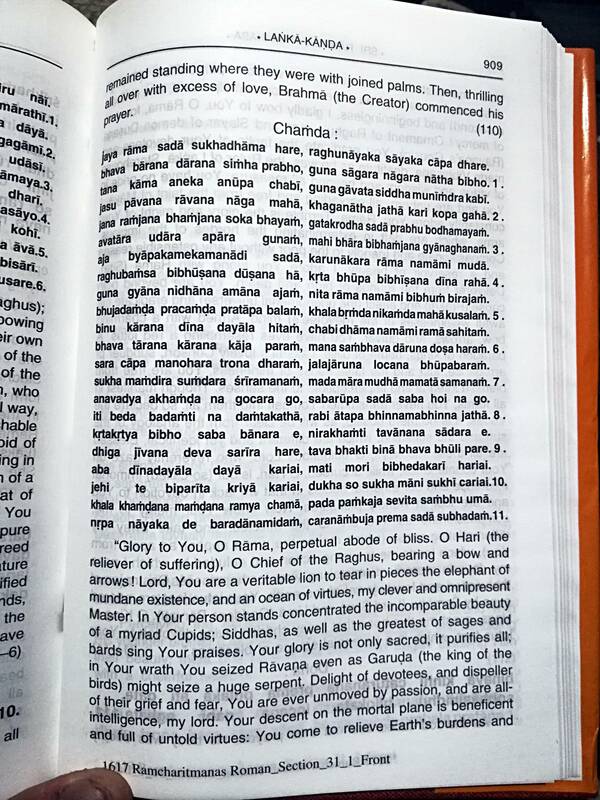 Virtually the entire Ramacharitmanas is Vishishtadvaitic. Still if anyone finds more verses on Advaita, please feel free to edit my answer. Not the answer you're looking for? Browse other questions tagged rama identification-request advaita vishishtadvaita ramcharitmanas . Is Jagadguru Ramanandacharya considered an incarnation?